Are you a company looking for a volunteering opportunity that helps make a positive difference to people's lives? We know that many businesses offer their staff the chance to participate in a days volunteering. To us, these days are so valuable; they can be spent with our clients on a day trip or they can take the form of a practical task such as decorating or a garden project, or how about both, some gardening in the morning and then an enjoyable afternoon tea with the residents. 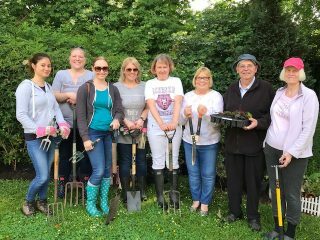 Volunteering days strengthen the bond of existing colleagues from a department, and are also great for building relationships between departments. As a company it demonstrates your CSR commitment and contributes to the community. In addition it raises your company’s profile in the local community. Volunteers feel engaged with the charity and gain a sense of well being and confidence. They develop a sense of achievement and satisfaction having helped. Volunteers feel energised and motivated and are often keen to return.